Sometimes, you open a new book and instantly know that it’s going to be unlike anything you have ever seen before. Everything seems new and fresh, from the artwork to the setting. This was the case when I started to read the first issue in the new volume of Scrimshaw. Set in the far future, the world looks pretty grim. Greedy corporations have taken hold of the government, and the world is in decay because of global warming. Captain Hans Tanaka captains the Runaway Horse, an old ship that has seen better days. Along with his crew, who are branded as pirates, cut-throats, and mercs, they sail from one adventure to the next. After an event that is briefly explained, they are now on course for America. Their mission: to break into a military installation in New Texas and take the head of the man who controls it. 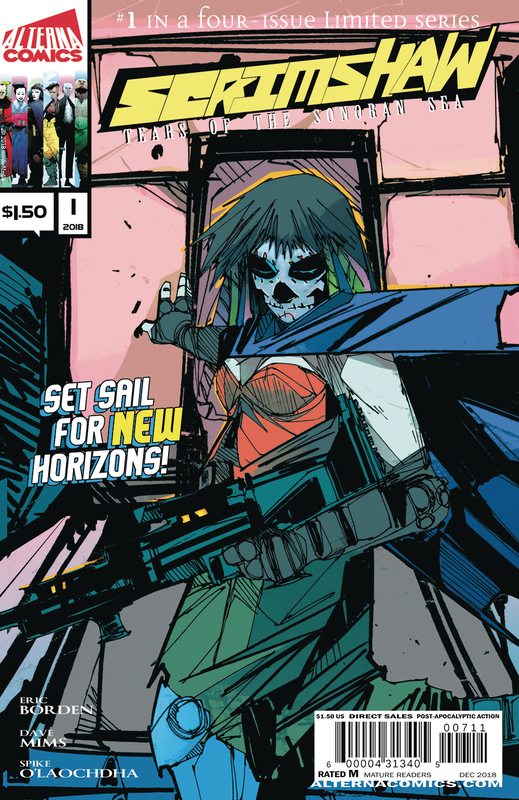 Written by Eric Borden and art by Dave Mims, Scrimshaw has a style all its own. It has a very interesting steampunk / pirate aesthetic, with a sketch like quality to the character designs. The world that the crew of the Runaway Horse inhabits is simple, but also very bleak and quite grim. This first issue puts you right in the middle of the high seas with Tanaka and his very diverse crew. The story starts a new adventure for them, but not the first. This issue was mainly set up, so not a lot of action, but quite a bit of story, which is good. It’s a great introduction to the world and sets it up for future issues. Scrimshaw has an interesting premise, with an art style that’s unique and interesting. This first issue was good, and I do not doubt that it will lead to greatness. Can’t wait to see what happens next.